Or are you interested in visiting Canada? 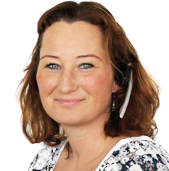 Picking up a motorhome on the day of arrival is not permitted! Save up to 10% on extended bookings. For detailed discount information see the following list. Save up to 15% off your booking e.g. for the winter season if you book before 31st of July. A general rule for motorhome reservations is: the earlier you book, the better the specials and availability. All returning customers from Cruise America and Cruise Canada over the last 2 years get one 500 Miles package on top for free. Please mention your old Booking Nr. and "500 Miles" during booking. 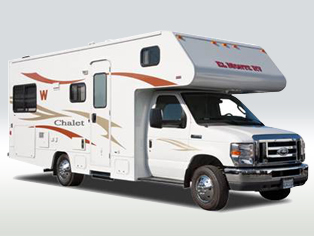 El Monte is a privately owned motorhome rental company with more than 40 years of experience in the motorhome rental industry. GPS for free for all returning El Monte customers from FTI. Please mention your old Booking Nr. and "GPS" during booking. on the daily rate for rentals lasting 21 days or longer. 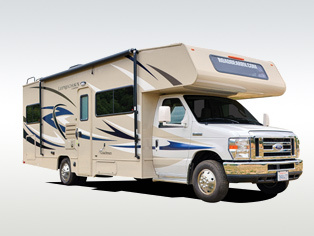 Road Bear has been known for its service and quality motorhomes for over 30 years! Operating one of the youngest fleets in the motorhome rental industry, all of their vehicles are guaranteed to be a maximum of 2 years old. discount on the base rate for rentals lasting 42 days or longer. When purchasing the optional Camping Equipment at the rental location (additional costs apply) you will receive a rental navigation system for free. Apollo RV. With an upscale interior and a very attractive All-Inclusive packet, Apollo offers a vast variety of motorhomes for anyone who enjoys the comfort of driving a higher class vehicle. Britz, the well-known motorhome rental company from Australia and New Zealand, has now set up shop in the United States. Receive a 10% discount on the base rate for rentals lasting 42 days or longer. Receive a 5% discount on the base rate for rentals lasting 21 days or longer. on the base rate for rentals lasting 42 days or longer. on the base rate for rentals lasting 21 days or longer. Best Time RV - Featuring one of the newest camper fleets in the market, Best Time RV specializes in small, modern motorhomes in the Southwestern United States. Jucy Rentals a camper van specialist who, for years, has already offered fun, ingenious, and simple to use camper vans in New Zealand and Australia. Now, these practical camper speedsters, are also available in the USA. on the base rate for rentals lasting 41 days or longer. on the base rate for rentals lasting 31 days or longer. Most rental companies offer special packages or discounts for certain rentals. Some of these include discounts for extended rentals of 21 days or more, others simply offer free extras like vehicle kits or navigational systems. Here it's important too to book early, in order to save more! Check available discounts here. Including the desired mileage in your rental package is usually more cost effective than paying for miles at the rental location. Once you enter the mileage, the system will then display offers including the requested miles. If you are not sure how far you will drive, simply enter your route into a route planner. This will give you an approximate distance. To give yourself enough time for sightseeing and breaks, you should plan on driving no more than 1.100 miles per week. Picking up the motorhome on the first day of arrival form an international flight is not allowed due to insurance regulations. The transfer from the hotel to the rental station is offered by most rental companies (please check the terms and conditions for transfer information). Pick up is only possible from a hotel listed in the transfer hotel list. Usually, it is not a problem to find a space for 1 night. If you travel during June through September, we recommend that you reserve your campground space ahead of time, especially in areas close to national park campgrounds. Tell us about any special requests and we will be happy to assist you. * Price is based on a 14th day rental term. Road Bear has been known for its service and quality motorhomes for over 30 years! Operating one of the youngest fleets in the motorhome rental industry, all of their vehicles are guaranteed to be a max. 2 years old. JUCY Rentals - a camper van specialist who, for years, has already offered fun, ingenious, and simple to use camper vans in New Zealand and Australia. Now, these camper, are also available in the USA. 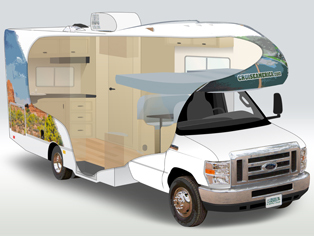 Are you looking for a Camper rental in Canada?